Here is a list of nominees in the major categories for the Grammy Awards, which will be handed out on Sunday in Los Angeles. 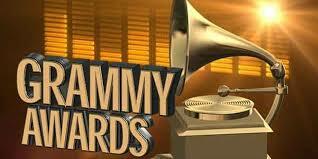 Rapper Kendrick Lamar leads the nominations with eight, followed by Canada's Drake at seven, AFP reported. Ella Mai with songwriters Larrance Dopson, Joelle James and Dijon McFarlane, "Boo'd Up"
Drake with songwriters Daveon Jackson, Brock Korsan, Ron LaTour, Matthew Samuels and Noah Shebib, "God's Plan"
Shawn Mendes with songwriters Teddy Geiger, Scott Harris and Geoffrey Warburton, "In My Blood"
Brandi Carlile with songwriters Dave Cobb, Phil Hanseroth and Tim Hanseroth, "The Joke"
Zedd and Grey, with songwriters Sarah Aarons, Jordan K. Johnson, Stefan Johnson and Marcus Lomax, "The Middle"
Lady Gaga with songwriters Mark Ronson, Anthony Rossomando and Andrew Wyatt, "Shallow"
Donald Glover (Childish Gambino) and Ludwig Goransson, "This Is America"